Mint condition book and dustjacket. As new. The 4th Fighter Group’s first pilots came from the 3 original RAF Eagle Squadrons. Men like Chesley Peterson, Don Blakeslee, Don Gentile and Jim Goodson. 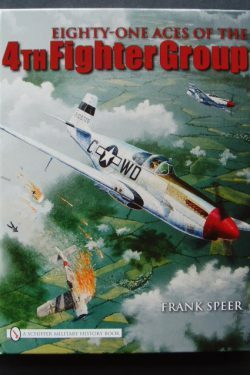 Transferring to the USAAF in 1942, armed with P-47s then P-51s and aggressive, seasoned pilots, the 4th FG battled the Luftwaffe in the air and on the ground, achieving an impressive score of 1,016 German planes destroyed, the highest score of all Allied Groups. Chesley Peterson commanded 71 Squadron aged 21 and was appointed to be the second Commander of the 4th Fighter Group aged only 23 and the youngest colonel in the USAAF. 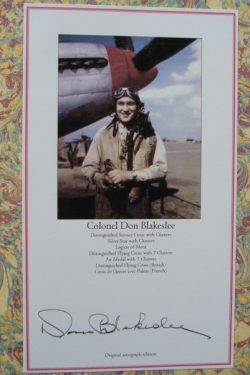 After more than 200 operational sorties, 7 victories and a chestful of medals including the British DSO and DFC, he handed command of the Fourth to Don Blakeslee. Don Blakeslee took command in early 1944. He flew more missions and fought the Luftwaffe longer than any other American pilot. He flew more than 1000 hours, over 400 missions and scored more than 15 victories. 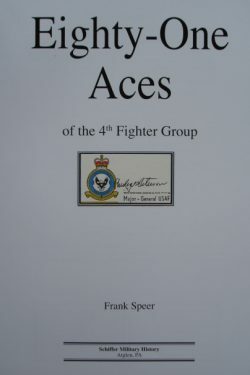 A fabulous book in all respects and ideal for mounting additional signatures of the 4th FG Aces.